The fourth quarter begins with a mild rally in the U.S. dollar. Today’s U.S. economic reports were very strong with the ISM manufacturing index hitting a 13 year high. The data shows that factories are booming and prices are rising. Although part of this strength can be attributed to hurricane related supply chain disruptions and energy costs, there is still underlying strength in the manufacturing sector as we’ve seen similar improvements in the Philadelphia and Chicago regions – two areas not affected by the recent hurricanes. Construction spending also increased 0.5% in August and is likely to rise further on rebuilding efforts. These positive reports along with new record highs in stocks should have driven USD/JPY to 113 and while the pair got very close to that level post data, the gains were given back quickly as bond traders struggle to keep yields up. The beginning and end of the month/quarter are always tricky to trade but this week could be a challenging one for the greenback with non-farm payrolls expected to come in much lower. However between now and then, the market clearly prefers dollars over other currencies and as long as yields and stocks continue to rise, so will USD/JPY. Technically, USD/JPY is in an uptrend with the 200-day SMA at 112 serving as clear support. As long as that level holds, the pair should make its way back above 113, targeting the Sept highs near 113.25. 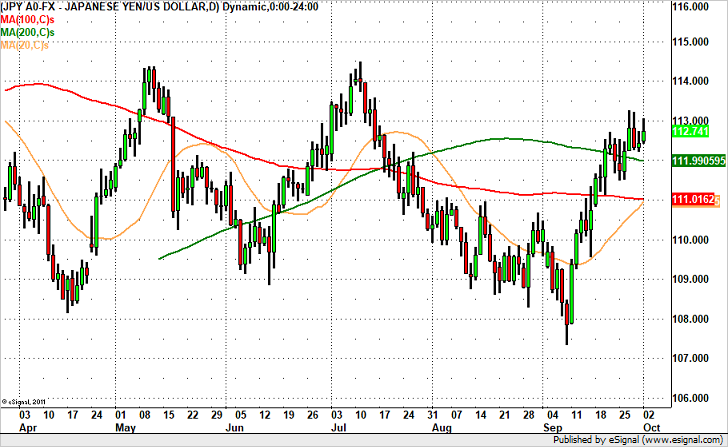 The 20 and 100-day SMAs are also crossing to the upside which is positive for USD/JPY.